Just in time for your weekend, ours in Iran is already over, I find time to write the summary of last week. As usual many things happened. The first 4 days we took it easy, cycling only short distances with hardly any altitude; it was “the cream” as we use to say. The landscape continues to be very green; there are many fruit plantations. Inbetween we pass very dry areas, we thing it being the beginning of the desert. The temperatures are very high and it is humid, the sky partly cloudy, what for once we enjoy. Whenever we stop to drink or to have a rest we get completely wet immediately from sweating. From the 5th day (1st Aug, our National day) the strains start, it goes uphill and the daily stages get longer. The road leads through the Golestan National Park. It is beautiful to cross this park with a lot of forest and accordingly much shade. Twice we even meet boars. They don’t seem to be wild anylonger, as they are fed by the Iranian tourist to get good pics. We have taken the opportunity to make some as well. At midday we take a nap in the shade. Just when we get ready to start again, a Police car stops. What do they want from us? Nothing in particular; they just want to chat with us, want to know where we come from from and where we are heading to. We even got the telephone number to call if we need help. The Police Officer said goodbye to Markus using the Iranina way: three kisses on the cheek as friends usually do, he seems to like him. Surprisingly we manage the 1200m uphill over the distance of 92km well. Our Planning had foreseen a shorter distance; but arriving in the village we had planned to stay overnight there just was no guesthouse. So we decided to go on, till dark cloudes announced a thunderstorm. We just managed to find a shelter at a closeby farm. We decided to stay at the farm if possible. Markus talked to 2 workers if we could put up our tent. After some discussion amongst the 2 workers they showed him an empty house where we could stay over night. We prepared our bed on the floor, pumped up our air mattresses and got the sleeping bag out. Like this we could avoid to pack up a wet and dirty tent in the morning. It twas rather akward and special to sleep in a place like this! It had bben a long time since we prepared our soup with nooddles on our cooker. After all these kebabs with rice and tomatoes this dinner felt felt like a dream. The next day we started early in the morning, departure was shortly after 6am. For the first time we got stopped by the army at a control post and had to show our passports. During the check of our visas they offered tea and bisquits in the office of the Chief of the station. All soldiers and officers on duty that were on the spot paid a visit to have a look at us and some even asked questions. Markus made some pics without asking permission! Before lunch we already arrived at Ashkhaneh, our destination of the day. We stopped in front of the only guesthouse there. Still looking at the house from outside (it didn’t really look appealing) we were approached by and English speaking Iranian. He invited us to stay at the home of his family. We thanked him but denyed is offer. He continued insisting that we pass by at least for lunch; we finally agreed to join for lunch. After we had a shower, Lahid picked us up at the hotel. Arriving at his familiy’s home, a very nice flat, the family was already expecting us; parents in law, 4 daughters of them with two husbands and five kids. The Lunch was already served on the carpet. It consisted of a broad variety of Iranian specialities, which one hardly gets in the restaurant. 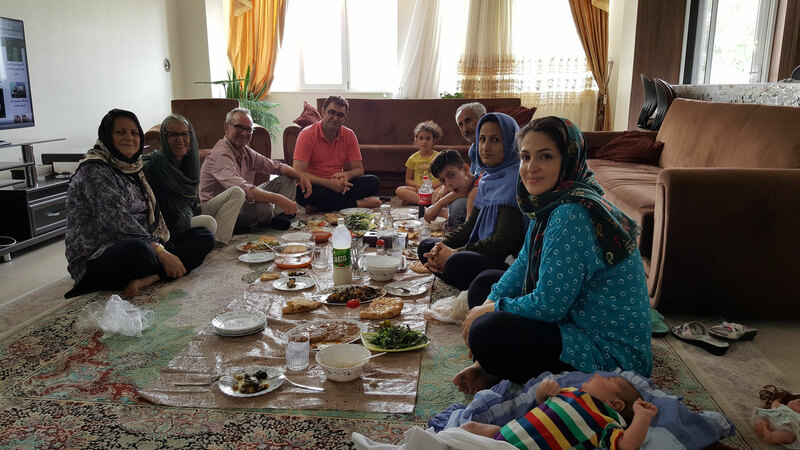 It was one of the best meals we had in Iran. The family received us very cordially. Even though only two of them spoke English, we had a good conversation. We spent the whole afternoon with them. Then we went to see the family onwed quarry with Yaser. Two of the kids joined us on the tour and had a lot of fun with Marie-Claire, exchanging English and Farsi words. Hind side we regretted not to have accepted the invitation to stay overnight, our hotel was not a good one L.
The next morning we got up at 5am. As we had another 1000m uphill to overcome, we wanted to climb it before it got too hot. The rise was tough, but we got rewarded by a lovely decent to Bodschnur .